Anyone who has ever owned and loved a senior dog can tell you how special they are. No, they don’t have the bounciness of puppies – but they have a calm serenity that more than makes up for it. They make wonderful bed buddies, couch companions and short walk pals. They ask for a few head scratches, a warm spot on the couch, a kind word now and then. They are content to simply be with you – they don’t need to be entertained, or kept engaged by ten mile walks. An outing in the car, or a short walk through town, and your senior canine companion is tired out and pleased. If you’re ready to share your life with a dog who will ask for little, and bring so much, then maybe you’re the right home for Sammy. Sammy the pug has a lot of love to give! Sammy has had a wonderful life. He’s been with his current family since he was just eight weeks old. In fact, he and the young daughter in the family are the same age and shared the same stroller when they were both much younger! That was a long time ago. Now, Sammy is 13, and blind, and maybe not quite so bouncy as he used to be, although for an elderly dog, he does very well. He comes when he is called, although he may bump into a few walls along his path, he can sit and down and bark on command. He loves to be in the middle of things, and he loves to eat. He doesn’t even mind if you grab him without any warning. He’s lived with kids all of his life, so he’s used to that. He can walk on a leash, although new places tend to frighten him. He likes visitors. Did I mention that he loves to eat? Sammy’s family moved into their current apartment just two months ago. 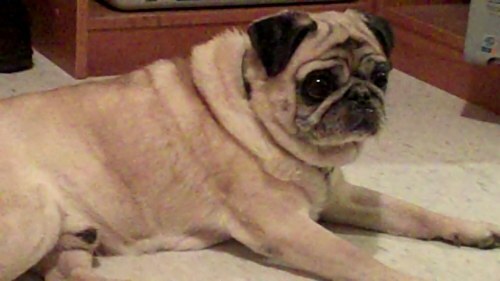 They thought that no one would pay attention to their little old blind Pug, but that’s not the way it worked out. Now they are facing eviction if Sammy doesn’t leave. A single working mom with a teenaged daughter doesn’t have many options. Sammy has to find a new home. And he’s got to find it before Thanksgiving. Sammy’s situation is pretty desperate, even though Sammy doesn’t know that. Do you have space in your home and your heart for Sammy? If you do, please contact Charlotte at 508-588-7968, or send an email to cccpups@aol.com. 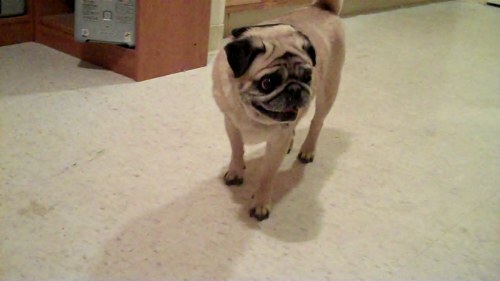 He may be old and blind, but he is still stuffed full of all the happiness and love that makes a Pug so special.